Conductivity is most commonly defined as a substance’s ability to transmit heat, sound, or electricity. In this blog article, we will focus on Electrical Conductivity (EC) which is the ability of a liquid to conduct an electrical current. Small charged particles called ions help to carry the electrical charge through a substance. These ions can be positively or negatively charged. The more ions available the higher the conductivity; fewer ions will result in lower conductivity. Also, the higher the conductivity, the higher a solution’s ability to conduct electricity. This is a result of a large number of charged ions present in the solution. What is the difference between Electrical Conductivity and Resistivity? Electrical Conductivity (s) is based off of conductance. Conductance is, simply, a substance’s ability to transmit current. Conductance is measured in Siemens. Conductivity looks at the conductance of a substance over a defined area. The units we use to measure EC are Siemens/cm (S/cm, mS/cm, μS/cm, dS/m). 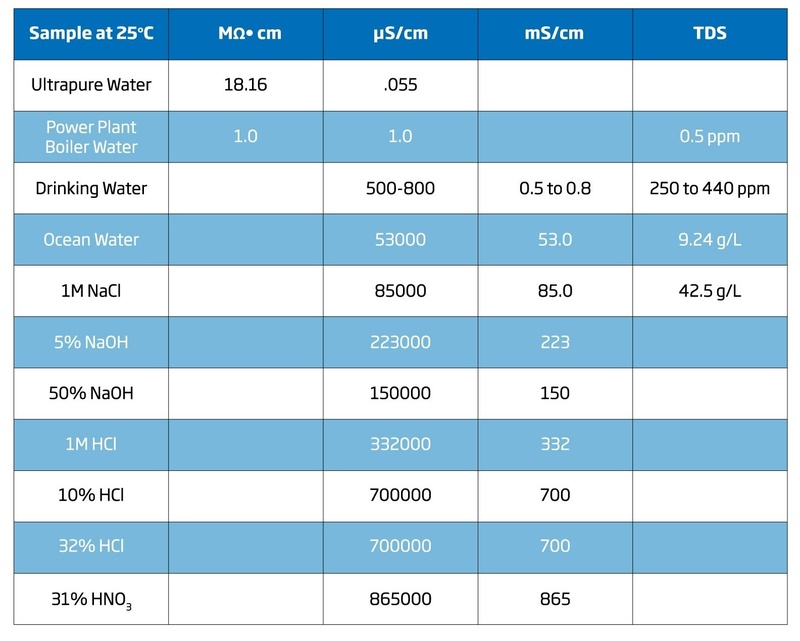 For example, ultrapure water has a conductivity of .055 μS/cm at 25°C. Electrical Resistivity (ρ) focuses on resistance which is a substance’s ability to not transmit current. Resistivity therefore is a measurement of resistance across a defined area of a substance. The units that we use to measure Electrical Resistivity include Ohm*cm. For instance, ultrapure water is said to have a value of 18.16 Mohm.cm. at 25°C. Even though conductivity and resistivity are reciprocal units that can be converted easily, resistivity is typically used for very low electrolyte concentrations or trace contaminants such as ultrapure water and conductivity for expressing meaningful salt levels, i.e. saltwater; electroplating baths, and acid concentrations. Which industries rely on EC measurements? Now that we have given you an overview of Electrical Conductivity (EC), let’s take a look at specific applications of EC and which industries utilize EC measurements on a regular basis. When it comes to the Agriculture Industry, knowing the Electrical Conductivity of soil is extremely important for the health and growth of crops. Farmers and growers alike are oftentimes concerned with monitoring phosphates, nitrates, calcium, and potassium of soil as these nutrients are essential to successful plant growth. Testing the Electrical Conductivity (EC) of soil can help growers keep track of all the nutrients present in their soil. EC can indicate the amount of nutrients in soil, and assists growers in determining whether their soil requires more nutrients or whether there are too many nutrients present. 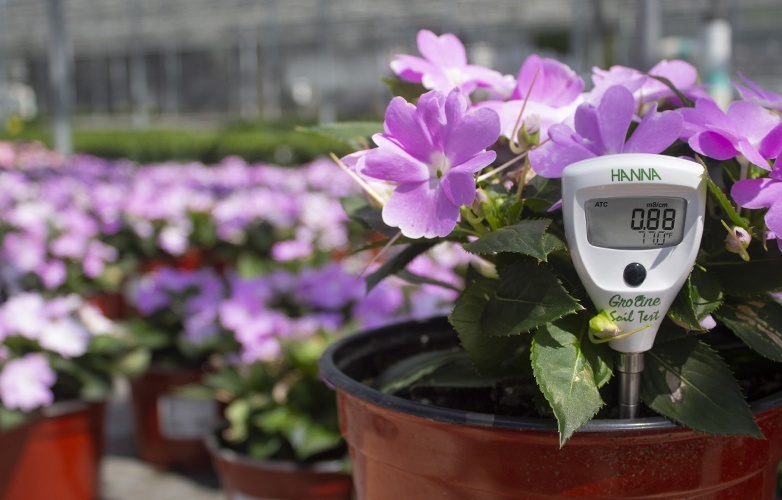 Measuring the EC of soil saves growers money in the long run, and ensures healthy crop production. Electrical Conductivity (EC) plays a big role in different water quality applications. In waste water treatment, EC is measured to ensure the salinity of outgoing waste water is comparable with the body of water it is being discharged into. Releasing water that has an extremely high or low salinity can have detrimental effects on the health of aquatic life. Keeping EC measurements within the acceptable ranges is essential and instrumental in maintaining a healthy and sustainable ecosystem for our oceans and waterways. Conductivity can affect electroplating baths as well, and it is a common test in industries such as aerospace, automotive, and jewelry. Oftentimes metal plating rinse baths are used to remove residual chemicals from plated objects. When this occurs, countercurrent rinses help to minimize the wastewater that is generated. Measuring the conductivity at this point of the plating process determines whether more water is required and needs to be flushed in. Conductivity measurements can be used to provide useful industry specific measurements such as Total Dissolved Solids (TDS) and Salinity. 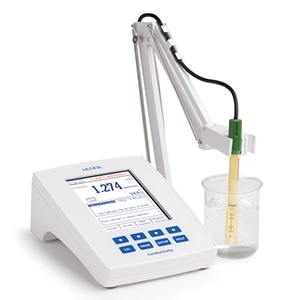 Total Dissolved Solids (TDS) is used to determine the solid content of a solution. An EC measurement is commonly used to estimate TDS. This assumes that the solids are ionic in nature and the relationship between the dissolved ions and conductivity is known. TDS uses measurement units of mg/L (ppm) or g/L. Certain conductivity meters allow the user to input the TDS factor for the conversion, however on more basic meters the factor is automatically set to 0.50 typically. The TDS factor for strong ionic solutions is 0.5 and for weak iconic solutions such as fertilizers it is 0.7. It is important to note that the TDS conversion factors are different for every solid. See the equation and example below to see how you would convert an EC measurement to TDS. Example: 100 uS/cm conductivity is a TDS of 59 ppm when the factor is 0.5. Conductivity meters have the algorithms to convert the conductivity measurement to the desired scale. How does Temperature impact Conductivity? One thing to also keep in mind is that the temperature of a substance will impact your EC measurements. The ion activity and concentration of a substance is dependent on temperature and this in turn influences conductivity. The higher the temperature of a solution, the lower the resistance (which equates to a higher conductance). Conversely, the lower the temperature of a substance, the higher the resistance (and the lower the conductivity). Integrated temperature sensors in conductivity meters measure the solution temperature in real-time. Compensation corrects the measured conductivity to a reference temperature by applying a fixed factor β for linear compensation. Advanced conductivity meters allow the adjustment of β to compensate for various solutions and permit adjustment of a reference temperature over a wider range of temperatures. Which instruments can you use to measure Conductivity? There are several types of conductivity probes that can be paired with a conductivity meter to collect accurate conductivity measurements. This is a 2-electrode probe that utilizes an amperometric approach to make the measurement. These two electrodes are insulated from each other, but remain in contact with the solution you are measuring. This probe works by applying AC voltage at a specific frequency between a pair of electrodes in a solution. Two-electrode probes do not require much sample to cover the sensor, but they have a limited range. If you are testing samples with variable conductivity, you may need to purchase more than one 2-electrode probe and/or meter. This is a four-ring probe that uses the potentiometric approach to make a measurement. An alternating current is applied to the outer two “drive” electrodes to induce a current through the solution. The inner electrodes measure the potential drop caused by the current. Four-ring probes are able to cover a wider ion concentration range, and offer a higher degree of accuracy. However, they do require a larger sample size. 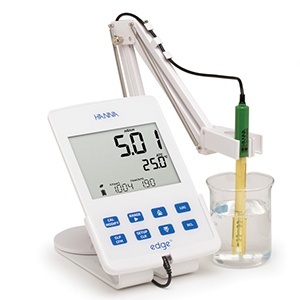 Hanna’s edge®EC (HI2003) can measure Conductivity, TDS, and Salinity and is a convenient table meter design. edge®EC (HI2003) uses a four-ring conductivity probe that allows you to measure samples from very low conductivity to very high conductivity. edge®EC (HI2003) is incredibly versatile and can be used in several different environments without taking up the space of a traditional benchtop meter. For additional space in the lab, you can use the wall mount cradle. Hanna offers a Laboratory Research Grade Benchtop Meter (HI5321) as well. Our HI5321 is an advanced research grade benchtop EC/TDS/Salinity/Resistivity meter. This particular meter is completely customizable with a large color LCD, capacitive touch keys, and USB port for computer connectivity. Our Laboratory Research Grade Benchtop Meter (HI5321) has an extended range from 0.001 μS/cm to 1 S/cm. In addition, it is preprogrammed with USP <645> method compliance for water for injection (WFI). 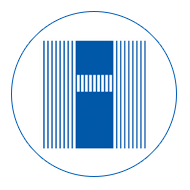 The HI5321 provides specific instructions on how to perform each testing step and automatically monitors the temperature, conductivity, and stability during testing. Another analytical instrument that Hanna offers is our Waterproof Portable EC/TDS/Resistivity/Salinity Meter (HI98192). This portable meter is supplied with all of the accessories you need to perform EC, TDS, Resistivity, and Salinity measurements in a rugged carrying case. Designed with a four-ring conductivity probe, and a built-in temperature sensor, it produces accurate readings. This waterproof portable meter complies with IP67 standards and features an expanded conductivity range from 0.000 μS/cm to 1000 mS/cm actual conductivity (400 mS/cm temperature compensated). 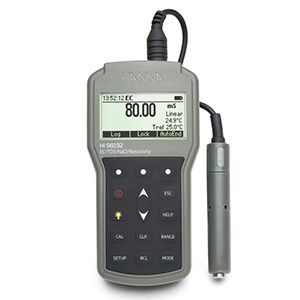 Our HI98192 portable meter also has ranges for TDS, resistivity, and three salinity scales. Brown, M. (2015, October). Electroplating: What Every Engineer Needs to Know. Retrieved from https://www.engineering.com/AdvancedManufacturing/ArticleID/10797/Electroplating-What-Every-Engineer-Needs-to-Know.aspx.